Plug the device into any USB power source (i.e. a port on your computer, home router, a mobile power bank or power adapter). Tip:Slowly flashing of blue light indicates normal state. (Once powered, the light will blink continuously, please wait until it slows down). From your smartphone or laptop, look for WiFi network named "btfly-xxxx" default password is 12345678. (Password Change Instructions in Advance setting 1). A "login to your local WiFi network" window will automatically pop up on your screen. If not pop up automatically, please manually type in web address [http://192.168.154.1]. Follow the instructions on the screen, select a local existing WiFi and enter your WiFi password for connection. When connected, the LED light will keep steady blue. Once your local network is set up, all Wi-Fi compatible devices can be connected to the wireless network "btfly-xxxx." VPN Default setting is Intelligent Mode. Change Full Mode or TOR mode in Advanced Setting 2. Change WiFi name and password Access [http://192.168.154.1] setting page. Wireless Setup: Both “btfly-xxxx”name and password can be changed. Access the [http://192.168.154.1] page and go to advanced settings. Intelligent Mode (default) The system will automatically choose the best line according to the website visited. For example, it will use server in China if you are visiting Youku, QQ and change to non-China server if you’re visiting YouTube. Note: Please use Full mode if you have access issue when visit specific website. Full Mode It can fix the line area, all traffic is forwarded through the VPN, which may affect the speed. If you want to set a single area IP distribution, select the Mode region, and region options: China, Taiwan, United States, Europe，Singapore and Japan and etc. TOR Mode All traffic is transfered anonymously through the TOR network. I. What Does Each State of the Indicator Light Mean? 4.You can use the browser to access the http://192.168.154.1 again after connecting to the Wi-Fi, to turn on or off the lights. 4.Close the browser's proxy server settings (Proxy); Try Chrome or Firefox instead. At present, Chinese characters and special characters are not supported. You can change the name of Wi-Fi in your home to a combination of pure English letters and numbers, and try again. 3.Change Wi-Fi channel of home router to 13 to reduce wireless interference. Note that if the phone or the computer can not find Wi-Fi at home after the change, please change the channel back to 1-11 through the wired router login. 2.Bind to public WiFi with dynamic password - same operation as above. After binding the network without filling in the password, operate as usual when the dynamic password page pops up. (Enter the phone number or room number according to the instructions.) If there is no automatic pop-up dynamic password page, please open the browser http://c.btfly.info , and then operate in the dynamic password page of hotel that pops up. 3.On iOS, if authentication fails, try to find btfly-xxxx Wi-Fi in your iPhone's Wi-Fi settings and click on the "i" button next to turn off “Auto-Login”. 7.Make sure your phone supports the hotel's own Wi-Fi channel. For example, U.S. phones only support channel 1-11. If the hotel's Wi-Fi channel is 12-13, the phone can not connect to the Wi-Fi channel. Butterfly itself supports all 1-13 channels. If the hotel Wi-Fi is identified as 12-13 channel, blue tips will pop up on Butterfly's network binding page. 8.Butterfly router cannot be used when dynamic password is bound directly to mobile devices. It can be used as usual. 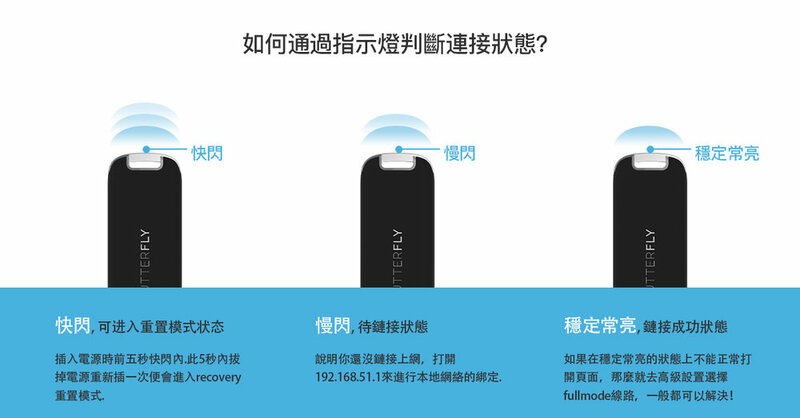 Open the mobile phone hotspot, use other devices that need VPN (computer, iPad or another phone) to connect to the btfly-xxxx wireless network, open http://192.168.154.1 to connect to the mobile hotspot. Butterfly is a router, so it does not support hotspot devices to connect to the VPN itself. 3.Click the "Modify wireless network" menu, enter the modify page, and follow the instructions on the screen to modify. 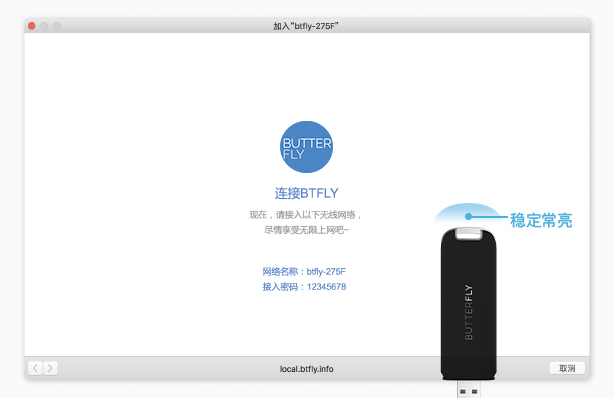 2.Plug the Butterfly VPN into the USB port. When it starts, the blue indicator will blink for 5 seconds quickly. During these 5 seconds, unplug the Butterfly VPN. Then, insert the BTFLY into the USB port again. 3.Find and connect an open wireless network named "btfly-recovery"
6.Select the reset file you just downloaded, upload, and click Continue. Butterfly will be reset. After the reset is completed, all the configurations are lost and returned to the factory state. Please use the default password 12345678 to connect Butterfly VPN and complete the binding hotspot configuration. If you can not access foreign Internet sites, in many cases it is because that the system has got the wrong DNS resolution results and cached them down. In this case, some sites can be accessed while other similar sites cannot. Because both the operating system and Chrome browser perform DNS caching, cleaning up the DNS cache requires clearing both the operating system and the browser's cache at the same time. Start your browser and enter chrome://net-internals/#dns in the address bar Click "Clear host cache" on the page Enter chrome://net-internals/#sockets in the address bar Click Close idle sockets and then click Flush socket pools. Clearing the web browser cache forces the browser to load the latest version of web pages and programs that users access. The operation of deleting Web Cache in Internet Explorer (IE) varies with IE and Windows versions. In IE, select "Tools" ("Internet Options" or "Security"), then select "Browsing History" to find the option to delete the cached Web page. Click the Customize icon on the browser toolbar Select "Settings", then select "Show Advanced Settings" Under "Privacy," select "Clear browsing data." In the dialog box that appears, select the checkbox for the type of information you want to delete. Use the top menu to select the amount of data to delete. Select "All" to delete all the information. Click "Clear browsing data"
**Can I use Butterfly to watch Netflix, Amazon Prime or Hulu? The Butterfly smartly chooses the IP address to access to the network, so the IP is changeable, which makes it difficult to get access to such content due to the strict proxy detection from those companies. You may use Full mode to select different regions to watch Netflix or Hulu but it is not 100% garuanteed. We will try to solve this issue in the next upgrades. The system will automatically choose the best line according to the website visited. For example, it will use server in China if you are visiting Youku and change to non-China server if you’re visiting YouTube. It is the recommended selection. After connecting btfly, and login http://192.168.154.1, click on the Advanced Settings below Click on the VPN in the list above, select the Full Mode, and the specified area you need Currently available lines are: China, Taiwan, United States, Europe and Japan. This product is mainly for business people, so there is no special design for the game speed optimization. We do not guarantee the gaming speed. All traffic is conducted anonymously through the TOR network.